Each Spring, the Recycling Association of Minnesota partners with local governments, soil and watershed districts, nonprofits, and other organizations to provide quality rain barrels and compost bins made from recycled materials at low cost to Minnesota residents. Our Spring 2019 rain barrel and compost bins are on sale now! Pre-purchase your rain barrel and compost bins today and pick them up at your nearest distribution event! Many of our partners offer promotional discounts to their residents, be sure to check with your local site for sale opportunities. • 30” tall and 33” in diameter. 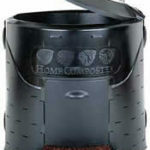 The Home Composter Bin is warranted by Gracious Living Corp. for 10 years from the date of purchase for any defects due to manufacturing or delivery excluding any damage due to normal wear and use. *Discounts may apply. Contact your local government for available promotional offers. Proof of residency is required at time of pick up for all promotional code redemptions. Find the location you would like to pick up your compost bin or rain barrel from below. Click “To order, click here” underneath the location address. A new page will appear with the available product for that sale. Add your merchandise to your shopping cart. Apply your promo code, if applicable, on the shopping cart page. You will see the price change in the subtotal. Pick up your product at the designated location and time indicated on your receipt. Pick up your order year round at the Environmental Center during open business hours. Our Spring 2019 sales are open to residents and non-residents alike. Purchase product from your nearest distribution event. If the nearest site is sold out, feel free to purchase from a different location. Cities of Brooklyn Center, Brooklyn Park, Crystal, New Hope SOLD OUT for 2019! City of Hopkins (Rain Barrels Only) SOLD OUT for 2019! City of St. Louis Park (Rain Barrels Only) SOLD OUT for 2019!